Notice how I said LESS not STOP snacking? Well, I believe moderation is truly the key. You cannot completely cut off yourself from something you like or else it'll just backfire. Your craving will build up and you will cave in one day. Instant noodles. 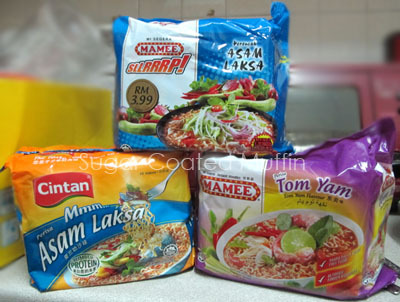 Yes, apparently bad for health and causes hair loss but I love the Cintan Asam Laksa & Mamee Tom Yum flavoured ones ^_^ I usually cook these in a microwave and pop in an egg to add nutritional value and lessen the guilt for eating something not too healthy. 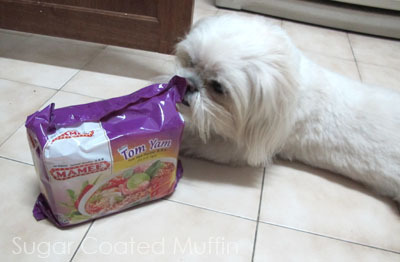 I'm totally obsessed with Maggi's Mee In a Cup as well (Tom Yum flavour). 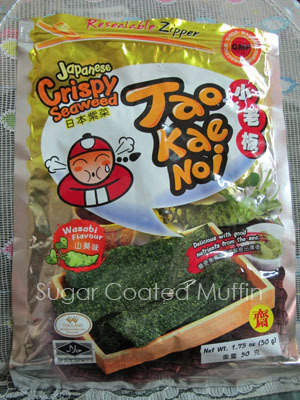 Tao Kae Noi seaweed! So crunchy and yummy.. Love that it's so thick, unlike those thin 5 layered ones. 1. Occupy your free time / sleep earlier. Thus, you'll have less time to sit around to snack. Also, I have a tendency to snack later in the night so sleeping earlier would solve that. 2. Keep snacks in a cupboard or drawer that is hidden away, in a room you don't really go to. Don't see, don't crave. Worst thing to do would be to place them somewhere convenient like in your living room, in front of your TV. 4. Brush your teeth or use hand cream. You may find it to be too much a hassle to brush / apply again so just forget the idea of snacking. This works for my sis but not me. 6. Avoid the snack aisle when grocery shopping or get someone else to grocery shop for you. Take a longer route, go around it, anything! Just don't walk through it. 7. 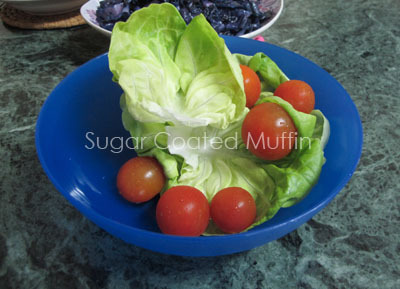 Snack on fruits and vegetables instead. Cut them so they're ready to eat. If you find it to be too much of a chore, get your partner to cut them for you and you cut back for him. Somehow doing something for my partner doesn't feel as bad as doing it for myself. 8. If you're buying just 1-2 items at the store, don't take a basket or trolley. You'll have a tendency to buy more. However, with only your hands, you can't carry snacks or unnecessary stuff to the cashier. 9. Don't browse snacks while waiting in line at the cashier. That's exactly what they want! Why else do you think they'll place that chocolate bar or mint there? So people would make a last minute impulse buy, of course! 10. Keep receipts and look back at them at the end of the month. Add up all the numbers and see how much you've spent on snacks in that month alone. Imagine all the useful things you could have bought with that money! By doing this post, I am in no way encouraging people to lose weight. Whatever size or shape you are, it's fine as long as you're healthy. Take that, Mr-Ex-Bf-Who-Asked-Me-To-Lose-Weight! I stopped consuming instant noodles for almost 4 months now..or probably more than that! (not that I'm keeping tab).. it wasn't for health reasons at first (probably had too much of it =_=) and I find I could concentrate and memorize stuff better now. 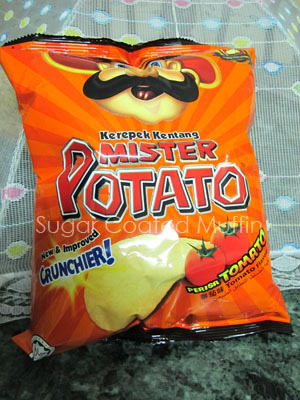 So I stopped eating it alltogether..
Mr Potato is my weakness! used to eat it all the time when I was a kid. XXD I don't crave for snacks too much though..my problem lies within fried stuff... U__U Ohh, I love fries and nuggets! There has been 'reports' that long termed consumption of the seasoning powder causes hair loss but you never know how true they are. And eating too much instant noodle coats your intestine in wax =/ Again.. Don't know if this is true. "By doing this post, I am in no way encouraging people to lose weight. Whatever size or shape you are, it's fine as long as you're healthy. Take that, Mr-Ex-Bf-Who-Asked-Me-To-Lose-Weight!" Hahahaha... I feel you. I went through same situation but mine was worse. He embarrassed me in front of our friends by saying I'm fat and that I seriously need to lose weight. I mean, hey, if you can't accept a person as who he or she is, why get into a relationship, right? I wouldn't say "take that," I'd say, "to hell with ya!" Hahahahaha. But yeah... it's better to control or eat in moderation. At least I've learned through experiences - by skipping junk and fast food for 4 months, managed to lose up to 15kg and I'm glad I did that.